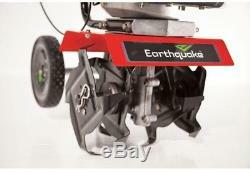 Earthquake 43cc 2-Cycle Gas Cultivator. 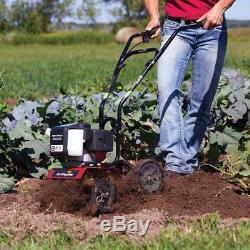 The Earthquake MC43 Cultivator is a garden superstar when it comes to weeding, working in fertilizer, or aerating soil. 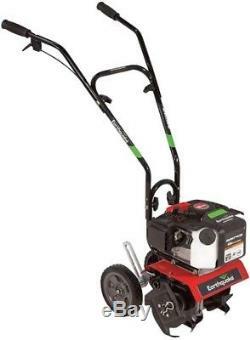 Its small size and light weight not only make it easy to transport, but it also increases maneuverability through garden rows without damaging your plants. The high-performance 43cc Viper engine delivers the right amount of power to work through all different types of pre-tilled soil. Variable speed, throttle and clutch control. Adjustable wheels for ease of transport. 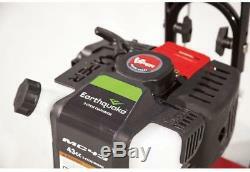 Optional attachable dethatcher kit or edger kit available. : 35.2 in Assembled Height in. : 40 in Assembled Width in. : 17.6 in Product Depth in. : 35.2 Product Height in. : 17.6 Tine length in. : 8.5 Wheel Diameter in. : 7.1 Wheel Width in. : 1.5 Adjustable Forward Speed: Yes Adjustable Handle: Yes Assembly Required: Yes CA (CARB) Compliant: CARB Compliant Commercial: No Engine Displacement (cc): 43 Engine Make: OEM Branded Engine Type: 2 Cycle Foldable handle: No Fuel Tank Capacity (gallons). 3 Maximum Till Width in. 72 Power Type: Gas Product Weight lb. If there's a problem, just let us know and we fix it. We guarantee you only the best experience when shopping with us! The item "Gas Cultivator Tiller Rototiller Soil Aerator Small Dig Earthquake 43cc 2-Cycle" is in sale since Friday, January 19, 2018.